The main difference between processor and coprocessor is that the processor is the main processing unit of the computer that performs arithmetic, logic and control operations according to the instructions while the coprocessor is a specialized processor that supports the main processor. 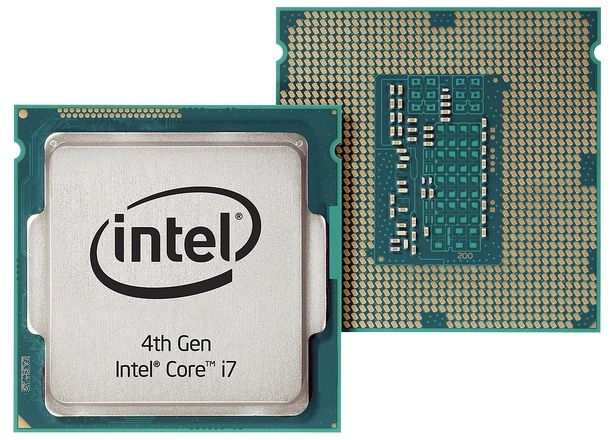 The processor is an important component in the computer. It executes instructions of the computer program and performs mathematical, logical and control operations according to the instructions of the program. It is also called the CPU, main processor, or the primary processor. On the other hand, a coprocessor is a special processor which supports the main processor. The coprocessor performs various tasks according to its type. It performs arithmetic operations, graphics processing, cryptography, signal processing, string processing and many more. A processor, known as Central Processing Unit (CPU), is an electronic circuitry within the computer. It fetches the instructions from the memory, and then decodes and executes them. The CPU can process 32 bit, 64 bit, etc. depending on the computer architecture. The actual execution unit within the processor is known as the core of the processor. There are two major units in the Processor: Arithmetic and Logical Unit (ALU) and Control Unit (CU). The ALU performs the arithmetic and logical operations specified by the instructions. The CU generates and sends timing and control signals to other components to synchronize tasks. Modern computers consist of multiple processors. These multi-processing systems are capable of performing multiple tasks simultaneously. Each processor will work independently, and it will not affect the other processors. A multiprocessor is more reliable and supports parallel computing. A coprocessor is a specialized processor that supports the functionality of the main processor. 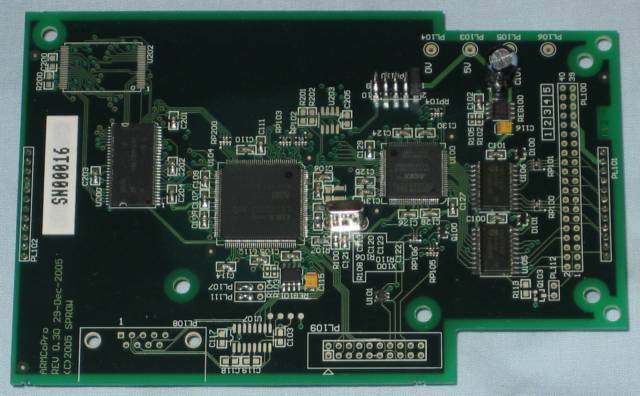 It can come as a part of the CPU package or in a plug-in board. There are several types of coprocessors as follows. Math processor can perform high-level mathematical operations such as logarithms, roots, trigonometry functions much faster than the main processor. It also performs floating point math. The instruction set of the math processor is different from the instruction set of the main processor. Network processor handles incoming and outgoing network traffic in high-end systems. It is optimized to process a large number of incoming and outgoing network packets. Crypto-processor is a special processor that supports cryptography. It performs message encryption and decryption for secure data transmission. Graphics Processing Unit handles high-resolution graphics processing. It consists of multiple cores with small instruction sets. A processor is an electronic circuit within a computer that carries out the instructions of a computer program by performing the basic arithmetic, logical, control operations specified by the instructions. A coprocessor is a computer processor that is used to supplement the functions of the primary processor. Furthermore, a processor can handle mathematical calculations and logical operations. It also generates and sends control signals to other components to synchronize the tasks. On the other hand, a coprocessor performs math operations, signal processing, cryptography, networking, depending on its type. While the processor maintains the proper functioning of the entire computer, coprocessor helps to offload the intensive tasks from the main processor, increasing the system performance. Processor and Coprocessor are two components of a computer. 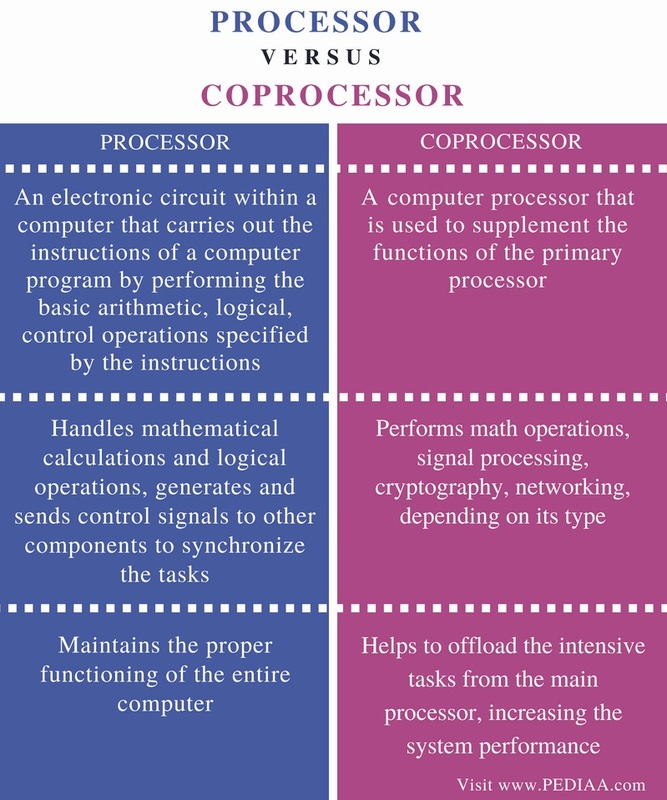 The difference between processor and Coprocessor is that the processor is the main processing unit of the computer that performs arithmetic, logic and control operations according to the instructions while the coprocessor is a specialized processor that supports the main processor. 1. “Central Processing Unit.” Wikipedia, Wikimedia Foundation, 16 Aug. 2018, Available here. 2. “Coprocessor.” Wikipedia, Wikimedia Foundation, 18 Aug. 2018, Available here.